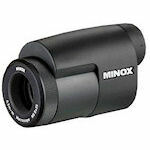 Minox MinoScope monoculars are like taking a versatile microscope into the field. With their 19" close focus you can examine insects and flowers at great detail or use them at longer distances for normal viewing. They have a bright 8x26 lens, are waterproof/nitrogen purged, and come with a pouch and carabiner for easy attachment to your belt. Minox MD C/CPW monoculars are 7x42 monoculars waterproof to 9.8 feet. Marine MD monoculars come with either a black or a white finish, while the tactical version is only available in black. All have extendable eyecups. 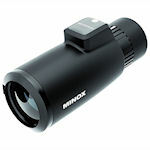 The Minox Minoscope is a monocular that acts like a tiny spotting scope and an 8x magnifying glass. The compact Minoscope weighs just 5.3 oz., fits in the palm of your hand and can close-focus to under 14 inches! The Minox Minoscope is waterproof as well as dust- and fog-proof.